Air India’s maiden flight to Israel has landed in Tel Aviv, reducing the travel time substantially after Saudi Arabia for the first time allowed a commercial flight to use its airspace, indicating a thaw in relations between the Arab kingdom and the Jewish state. 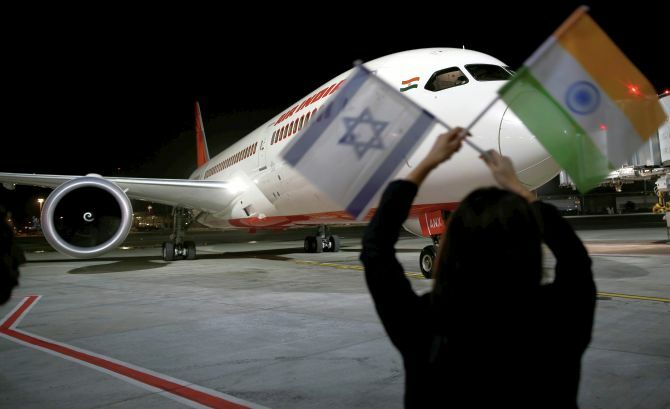 Heralding a new beginning in the people-to-people contact and diplomatic ties between India and Israel, the state-run Air India introduced the direct thrice-a-week flight from New Delhi to Tel Aviv on Thursday. Saudi Arabia permitted the airline to use its airspace, enabling it to take a shorter route, covering the distance in 7.25 hours, about 2.10 hours less as compared to the only other airline that flies between the two countries -- Israel’s national carrier El Al. Flight AI 139 landed at Tel Aviv’s Ben Gurion airport at 2215 PM (Israeli time) on Thursday, heralding a new chapter in the India-Israel ties and ending a decades-old overfly ban by Saudi Arabia. “This is really a historical moment... We are in a new era. I am sure that we will see many more Indian tourists coming to Israel... and Israelis would also come to India in much higher numbers,” Israeli Tourism Minister Yariv Levin said. He said such a direct link would further strengthen the relationship between the two nations. The Israeli foreign ministry said in a statement that Israel considers the new route important, noting that Prime Minister Benjamin Netanyahu raised the matter of the route with his counterpart Narendra Modi when the two met in July in Israel and then in January in India, Haaretz newspaper reported. The ministry said the route would also lower fares and boost investment and tourism from India to Israel. IMAGE: An Air India Boeing 787-8 Dreamliner plane lands at the Ben Gurion International airport. Saudi Arabia’s decision to permit Air India to use its airspace has enabled the airline to take a shorter route. Terming as “historic” the moment of arrival of the national carrier’s maiden flight to Tel Aviv, Indian ambassador to Israel Pavan Kapoor said a lot of efforts had gone into it over the last two years with a strong vision and support for the initiative from the prime ministers of both the countries. He said the initiative would strengthen the relationship between the two countries in various spheres, including political, trade and cultural. 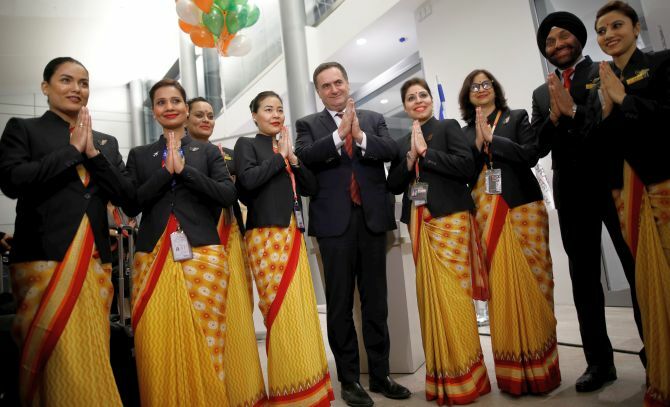 Air India Chairman and Managing Director Pradeep Kharola said the Air India direct flight has the shortest route connecting New Delhi and Tel Aviv and will bring people of the two countries closer. The flight will operate every Tuesday, Thursday and Sunday. While the inaugural flight AI 139 left at 6 pm (Indian time) on Thursday, the scheduled departure will be 4.50 pm (Indian time) from March 25 when the summer schedule comes into operation. The state-run carrier will be operating its 256-seater Boeing 787 Dreamliner on this route. Kharola and Israel ministry of tourism director Hassan Madah cut a symbolic cake to mark the start of the direct flight to Israel. Kharola had earlier said the airline anticipates interest from travellers from countries further to the east of India such as Australia. The Air India flew over Oman, Saudi Arabia and Jordan to reach Israel. The permission to fly over Saudi Arabia will save Air India almost 2 hours and 10 minutes compared to the longer route taken by Israels national carrier El Al, which has direct flights between Tel Aviv and Mumbai. El Al takes a circuitous route over the Red Sea, the Gulf of Aden and then enters India and avoids countries that are on the direct flight path such as Saudi Arabia, the UAE, Iran, Afghanistan and Pakistan. Does it make sense for anyone to buy Air India? Will it still be called Air India?